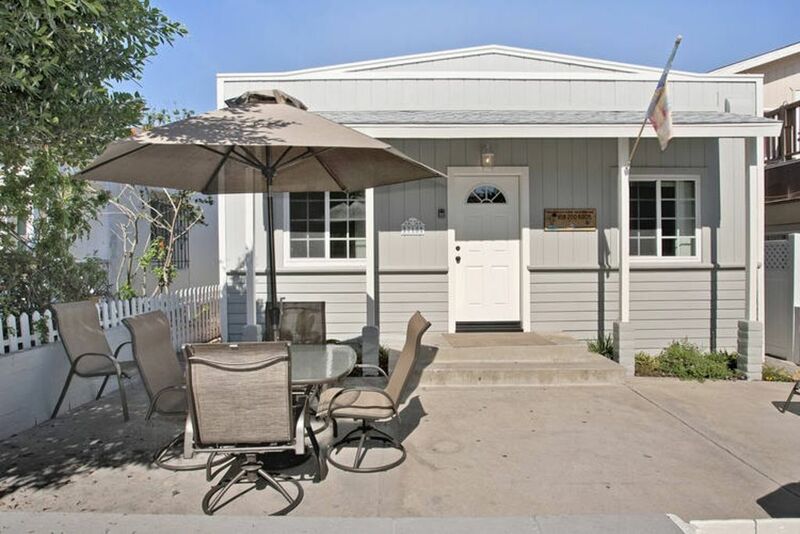 Sunny Mission Beach Vacation House is just steps away from the ocean. The unit is a 2 Bedroom 1 Bath unit that sleeps up to 6 people. This unit was completely remodeled in June 2010 and has new carpet, flooring, windows, appliance and granite countertops throughout! Don't miss out! The house has a large patio with a BBQ, table, chairs, and lounge chairs. The unit has a full kitchen and dining area. This unit is great for any family looking for a great summer vacation at the beach. Washer and drier are now available; shared with only 1 other rental unit. Just a couple of blocks from Belmont park, the vacation house can accommodate a family of up to 6 people. Swimming, beach activities, even Sea World and the zoo are within a short drive. We rent all year around so please contact us for any fall or holiday getaways! Relaxing Family Time only steps away from the beach. My family and I enjoyed our time at the beach in this cozy rental. The owner was very accommodating and was available to answer any questions. This trip was originally scheduled for another date and due to a family health emergency he allowed us to reschedule for this time. We appreciate this time that our family was able to relax. Thank you and we plan to return at another time in the future. Small, but clean and complete. So small no inside dining table, but nice table outside. Tough when the weather is cold or raining and six people. Nice location. Visitors need to park a distance. First of all, the owner, Seth, was incredibly helpful and responsive. We were in a bind and he helped us get into the rental early and it made our day. The unit is small and there’s no kitchen/dining table inside, but the location can’t be beat. The neighbors were lovely, we could walk everywhere, and could hear the waves right from the front door. My husband and I loved our time with our kids here. The garage space, washer/dryer, and dishwasher were fabulous for our longer stay. We really loved it here! Highly recommend! 75 steps from Mission Beach! This was a perfect vacation rental for our family of four. We ate in most of the time but there are many nearby options to eat out. The unit was updated and clean. Rent a smaller sized car if you plan on using the garage it is tiny like all of them in this area. This was the perfect home base for our Christmas vacation and would definitely stay here again. Don’t forget to give some love to the neighborhood cat Peanut. Great location. Owner was very accomodating. The location is great. The house compact but everything is there. The garage parking is very limited and we suggest no more than a mid size car as suitable ! Great location, nice place to stay. Can't beat the location, and it's a comfortable little place. Would stay again.